Bovis Homes South West apprentice Adam Elvin is a shining example of how apprenticeships can lead to exciting career opportunities in the house building industry. 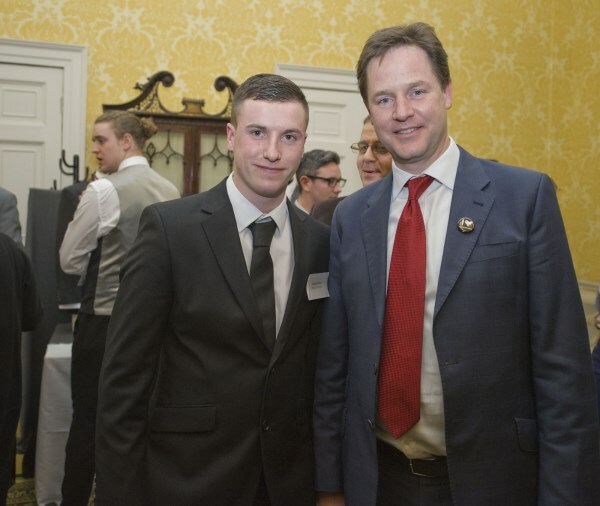 Fresh from meeting Deputy Prime Minister Nick Clegg at a special apprenticeship event at Admiralty House in London, the 21-year-old Bristolian has now landed a full-time job with Bovis Homes as an Assistant Site Manager. This latest milestone comes at the end of a three-year carpentry course working at Bovis Homes developments across Bristol, in conjunction with city council organisation On Site Bristol. He has started his full-time occupation at Bovis Homes' Knapps Meadow development in Watchfield, Oxfordshire. Reflecting on his apprenticeship, Adam said: "I looked at college courses but decided that an apprenticeship through On Site Bristol was the right thing for me. It's been a great opportunity at Bovis Homes, and I have really enjoyed learning a skill through practical, on-the-job training. "I'd recommend it to any young person who wants to get a first step in their career." Adam is so enthusiastic about apprenticeships as a route for young people that he has been visiting local schools and local community groups to talk about his experience. The Deputy Prime Minister said: "Apprentices not only make an invaluable contribution to their employer, but to the economy as a whole, and I was delighted to welcome Adam to Admiralty House in recognition of this." Bovis Homes South West Managing Director Malcolm Pink said: "As a business we are committed to developing dedicated young people like Adam through our apprenticeship schemes, with the support of parents and organisations like Onsite Bristol. "We are looking to get young people into construction, instil a strong work ethic in them and teach them skills that will set them up for life. Adam is a great example of how apprenticeships really work and open the door to a successful and fulfilling career. "Through our apprenticeship scheme we are aiming to recruit future site managers and business managers, special individuals who have shown an ability to learn and commitment to the business."